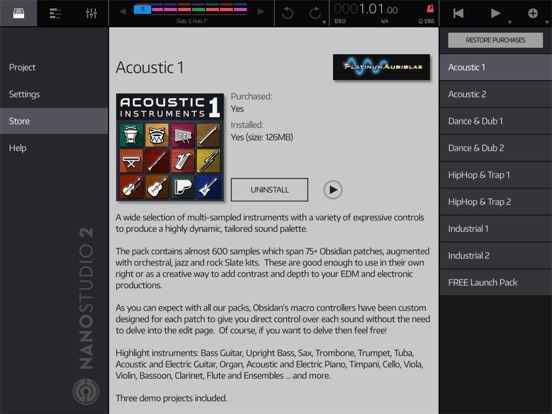 This leads to Obsidian, NanoStudio’s synth, which is definitely no afterthought. 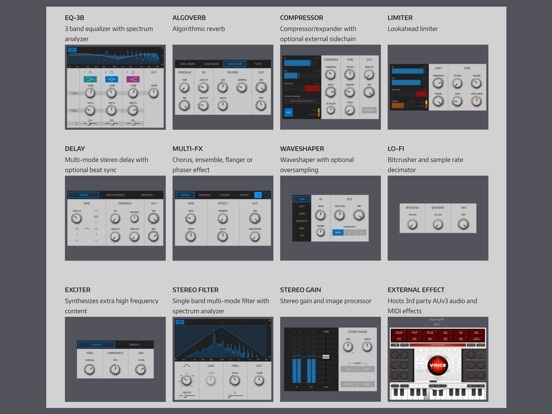 Obsidian is a 3 oscillator 16 note polyphonic instrument with 7 different synthesis methods available for each oscillator, including analogue, wavetable, FM, multi-saw and phase distortion. 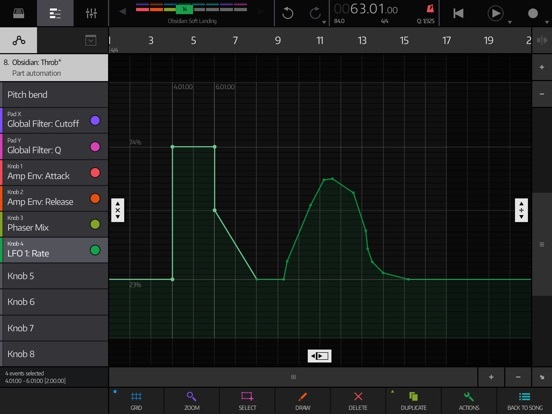 You’re not limited to synthesis as there’s also support for samples and multisamples, split by note or velocity. 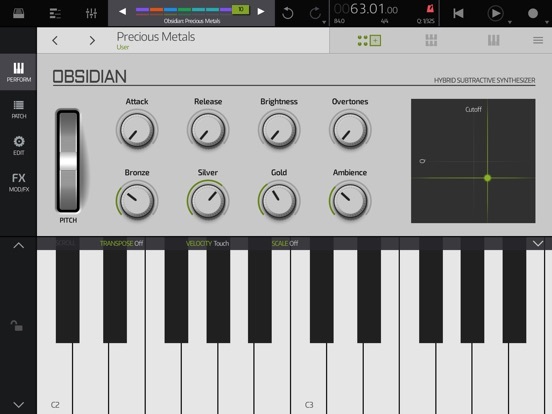 Obsidian has 18 different filter types, including resonant analogue, super clean digital, formant, comb and waveshaping. 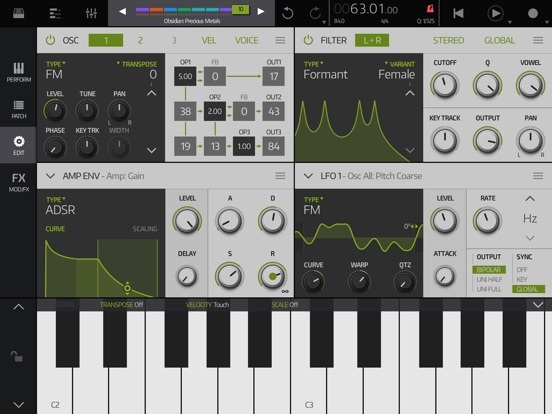 Nearly every parameter can be modulated via the synth’s 5 envelopes, 5 LFOs and 10 configurable macro controllers, and modulation connections can be assigned with just a few taps. 300 factory patches are supplied with macros set up and ready to go. It’s easy to create your own patches and there are many more professionally produced patches available as IAPs. 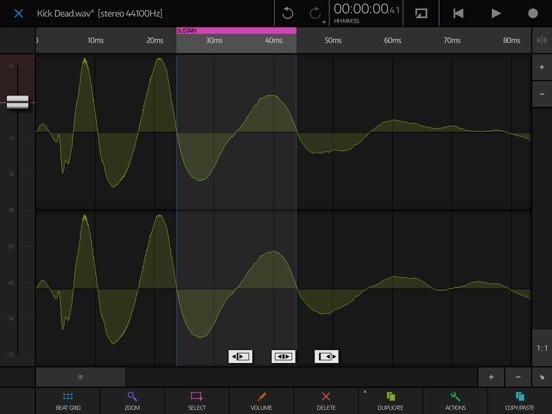 NanoStudio’s second internal instrument is Slate, a sample/synthesis-based performance pad which makes it easy to tap out drum beats. Slate comes with 500 quality factory samples ranging from multisampled acoustic drums with natural variation through to cutting-edge electronic percussion and effects. 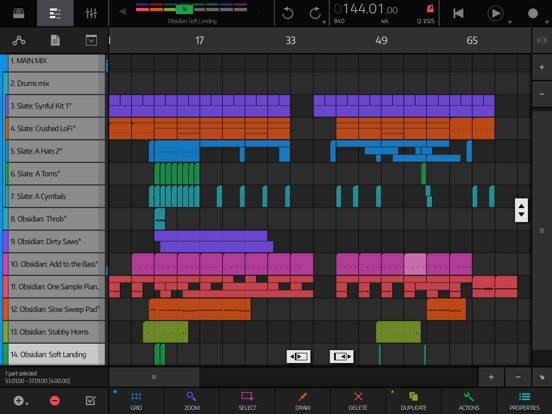 Its samples are arranged in 50 factory drum kits to get you started, and it’s easy to construct your own drum kits using the factory samples or your own. 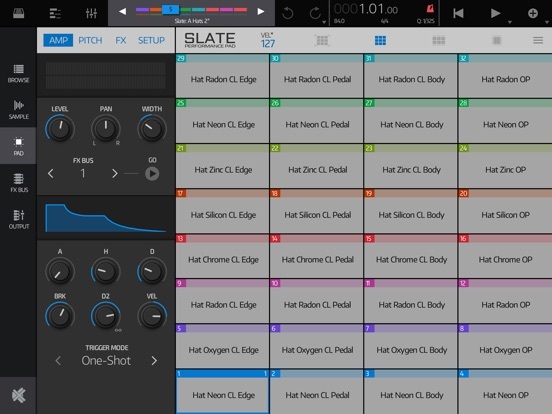 Slate can also be used with samples of just about anything: vocals, guitar riffs, synth pads – you name it. 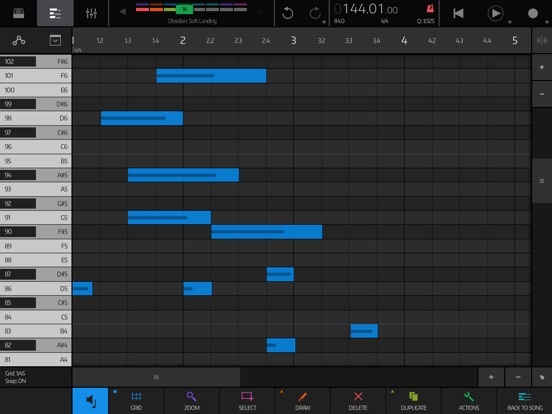 The sequencer supports tempo and time signature tracks (including tempo ramps) and Ableton Link. Everything’s brought together by a mixer with unlimited tracks, arbitrary track grouping and audio/MIDI sends. 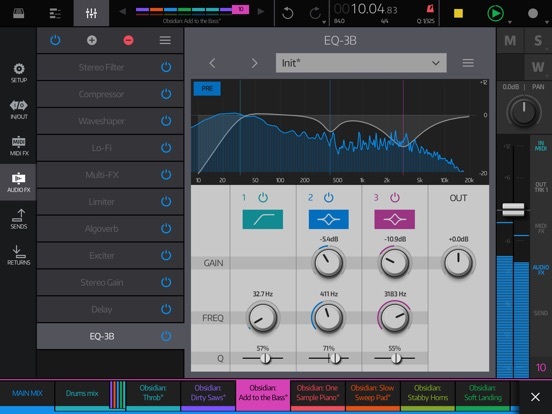 Tracks can have an unlimited number of insert effects and there are 11 effects to choose from, including reverb, sidechain compressor/expander, EQ with spectrum analysis, look-ahead limiter, delay, exciter, chorus, flanger and phaser. You can add AU audio/MIDI effects to the chain and use them just like an internal effect. There are many mixdown options available with quality settings up to 32 bit/96kHz and support for file formats including wav, aiff, ogg and M4A. You can mixdown track stems in a single operation or select just a region of the song - great for resampling. Sharing options include the iOS Files app, Dropbox, AudioShare, iTunes File Sharing, AirDrop, email, and importing from your iTunes music library. It’s a breeze to share multiple files in a single operation as NanoStudio automatically handles zip files for you. 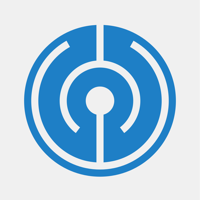 There’s also a built-in WebDAV server for full control and backup of your files using any desktop computer or WebDAV client.